My mom's favorite dessert. 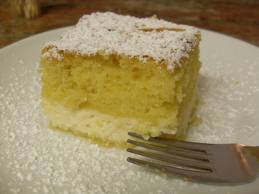 Ricotta Cake! Growing up my father did most of the cooking in our home because...well...he was a chef and my mom's cooking wasn't that great so thank goodness for his skills.BUT my mom did make some pretty good things and one of the things she loved was making this Ricotta Cake. Prepare cake mix as directed on box. And pour into greased 9x13 pan. Set aside. Add the next 4 ingredients into a separate bowl and mix thoroughly. Spoon Ricotta mixture gently on top of prepared cake mix and bake at 350 degrees for 45 to 50 minutes or until toothpick inserted comes out clean.